"Ladies and gentlemen�the story you're about to hear is true�"
Jack Webb stars as Sergeant Joe Friday of the Los Angeles Police Department in twenty taut tales of gun and badge from the 1955 season of Dragnet. Ben Alexander co-stars as Officer Frank Smith, with radio regulars Harry Bartell, Jack Kruschen, Peggy Webber, Virginia Gregg, Stacy Harris, Sam Edwards, and more rounding out the cast. 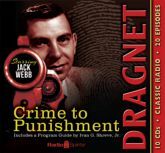 This Radio Spirits collection of digitally restored and remastered broadcasts offers the seminal police procedural at the peak of its success, when "from beginning to end, from crime to punishment," murder, narcotics, hold-ups and stand-offs were all in a day's work.